U.S. Recreational Boating Market size valued at over USD 20 billion in 2017 and is estimated to exhibit approx. 4.5% CAGR from 2018 to 2024. Increasing disposable income coupled with the rising watercraft sports activities across multiple states is primarily driving the U.S. recreational boating market share over the forecast period. Proliferating marine leisure industry owing to several activities such as sightseeing, swimming, pleasure voyages, entertaining, nature observation, and pleasure crafts voyages are further strengthening the business revenue. 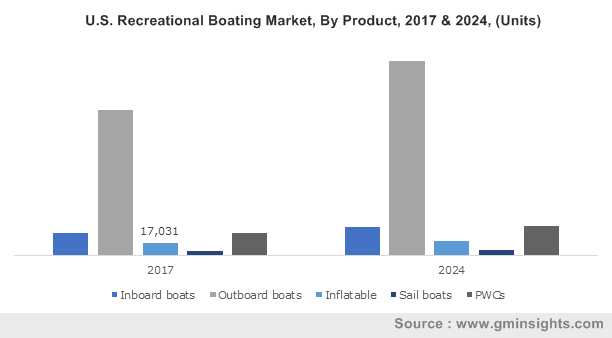 An upward trend in the U.S. recreational boating market size is witnessed owing to the technological developments in excursion boats. Manufacturers are actively investing in R&D to introduce versatile and affordable motorboats with enhanced technical features to attract the youth population thereby boosting the industry demand during the study time frame. Initiatives by the U.S. government to improve the nautical tourism and enhancing passenger safety in boats are strengthening the customers confidence to adopt the product, thus escalating the market demand. Proliferating boating participation across the nation owing to escalating customer spending for motorised water sports activities including rafting, canoeing, jet skiing, etc is enhancing industry revenue till 2024. Rising safety concerns including fatalities, injuries, damage to lives and property may hamper the market size over the study timeframe. High initial cost of the watercrafts coupled with environmental pollution concerns may further restrict the demand for the nation’s recreational boats. Ignorance of safety guidelines and improper maintenance of boats leading to safety concerns will limit the industry growth. The National Recreational Boating Safety (RBS) Program encourages boating participation and ensures better education about the safety, assistance, and enforcement activities to the public. The outboard boats segment in the U.S. recreational boating market share will account for over 70% of the volume share by 2024. This growth can be credited to the easier maintenance, and enhanced fuel efficiency, coupled with maximum cabin space availability on the powered boats. The personal watercrafts (PWC) segment is projected to account for approximately 11% of the revenue share by 2024 owing to the increasing water sports activities across the country. The diversified portfolio of powered boats coupled with easier manoeuvrability, compact footprint, and easier parking & towing facilities is further strengthening the segment share. The engine powered segment of the U.S. recreational boating market size will witness robust growth rate at around 4% over the study time frame. This growth can be attributed to the availability of diversified boat range such as outboard, inboard, and PWCs powered by the engines. Further, the engine options with various fuel alternatives such as diesel, petrol, and ethanol will further support the industry dominance till 2024. The man-powered boats segment is predicted to generate over USD 28.5 billion by 2024 owing to the availability of affordable boating alternatives. These boats are ideal for water sports and leisure activities such as river rafting, fishing, etc. Further the lower running costs owing to the absence of any fuel will further drive the market size. The Florida industry was valued at over USD 17 billion in 2017 and is estimated to continue its dominance till 2024. The dominance can be attributed to the stringent government regulation regarding the safety requirements in boats. The Texas region is anticipated to pose over 7% CAGR between 2018 and 2024. This growth can be credited to the presence of enhanced inland water bodies in the state. Mandatory education for people operating PWC and sailboats, coupled with encouraging government policies to promote safety in boats are further contributing to the industry growth rate. The rising disposable income across the state coupled with enhanced tourism and fishing sectors will positively influence the industry growth. 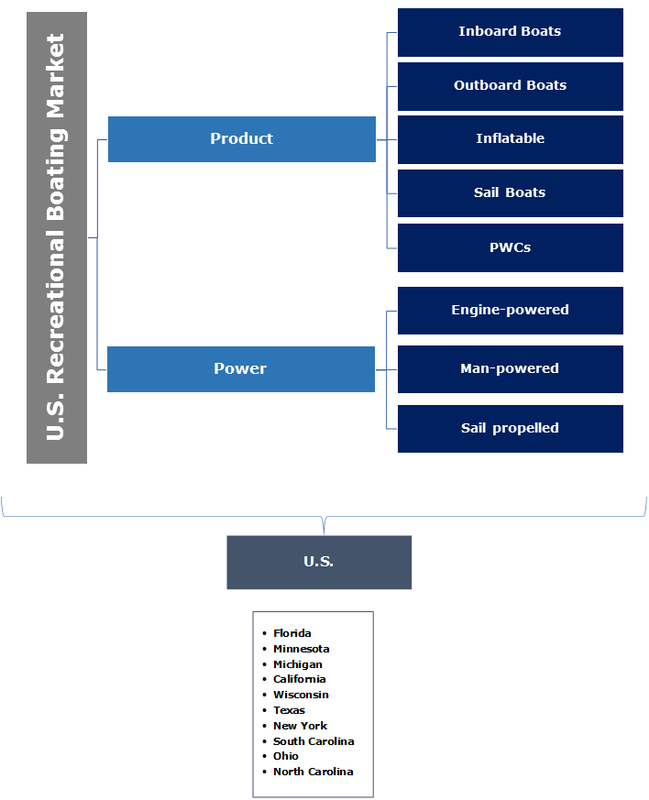 The U.S. recreational boating market players are American Sail Inc., Azimut-Benetti Group, Bavaria Yachts, Groupe Beneteau, Brunswick Corporation, and Catalina Yachts. Industry participants are emphasizing on introducing affordable versatile boats portfolio to attract the young middle-class consumers and maintain their market share. The manufacturers are focussing on strengthening and enhancing their dealership network across the country and invest in new technologies to enhance their product portfolio. Increasing customer spending for leisure and water sport activities coupled with rising disposable income is escalating the industry size over the forecast timeframe. Manufacturers are offering affordable versatile boating alternatives with attractive leasing options to maintain their market share.